Plan – to keep stress low, be sure to plan out the time that you are going to cook with your kids. Break things up into individual tasks that can be done over a few days. Snacks – it is easier to cook when you aren’t “hangry” so be sure to have a quick healthy snack before jumping into your recipe. A few whole grain crackers with peanut butter or carrot sticks and cottage cheese are great options. Safety – are the counter tops high? Is it easier to work on the kitchen table? Are there steps in the recipe that need an adult? What part of the recipe involves cooking on the stovetop? These are all great questions to ask yourself before you start cooking. Wash – it is so important to remember to have kids wash their hands and for you to wash your own hands. Model good behavior by washing your hands throughout the time when you are cooking. When you see your child touch their hair or scratch their nose, gently remind them of the germs that live on our skin and that we don’t want those to get into our food. To keep foods safe and avoid illness, be sure to wash all food preparation surfaces with hot, soapy water before beginning to cook. Read & Talk – Have your child read the recipe aloud lots of times. Talk through the steps and the ingredients so everyone knows their roles. Once to read the ingredients as you collect them, once to read through the steps, then again to go through the steps one-by-one as you work through the recipe together. 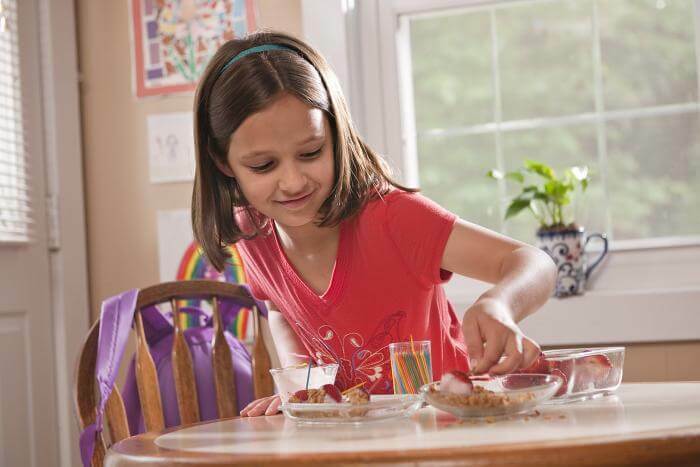 New Foods – cooking together is a great way to introduce new foods to your children. Children are more likely to try something if they have helped make it. Give your kids the opportunity to touch and taste thing throughout the cooking process (with foods that are safe to eat raw). Time – take your time when cooking with your kids. Be prepared for steps to take longer. Pick a time when you are not pressured by other events. Cleaning – By now you have already realized things are messier with kids. Make cleaning part of the routine. Remind kids that it is important to start with a clean kitchen, therefore it is important to clean up after you finish in the kitchen. Enjoy! – The first few times you cook with your kids may not go according to plan, but keep your chin up. Don’t get discouraged if your kids don’t eat a whole serving or they get distracted half way through. Keep the invitation to join you in the kitchen always open.